For those of you who come here for knitting content, stick around. For those of you who don't, move along; there's nothing to see here. Lots of knitterly fun and games going on this week. At the last minute I decided to drive down to the Madrona Fiber Fest in Tacoma. 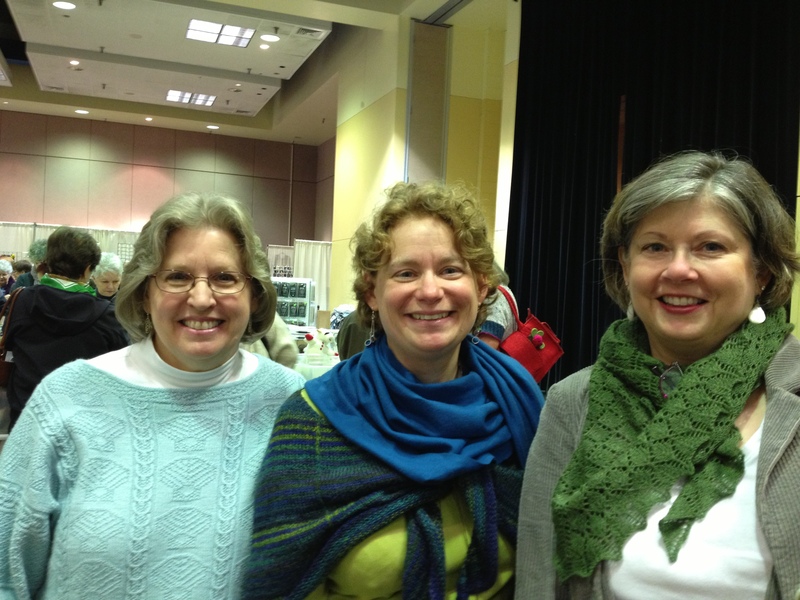 It turned out that Sally, the developer of Knit Companion, was going to be there! How could I pass up the opportunity to meet her? I quickly contacted Lorette, reserved my room and headed down there. We all had a wonderful time! As usual, John and Lorette treated me to high class accomodations and food, including wine and champagne. On Friday morning we headed to Madrona. We had a good laugh when Lorette asked me how we would recognize Sally. I said, "She'll be the one knitting." Well, that did differentiate her from the ones spinning! We managed to locate her and headed off to the market, where lots of fun, laughter, and – let's face it, yarn enabling ensued. First of all, let me say that Sally is just a genius. She shared with us some of her thoughts on developing Knit Companion and some of the upcoming developments. I've shared my enthusiasm for this program, but it just keeps getting better and better. What a treat to spend the day with her and get an "inside" look! I've been wanting to try some bamboo since seeing it profiled on Knitting Daily. 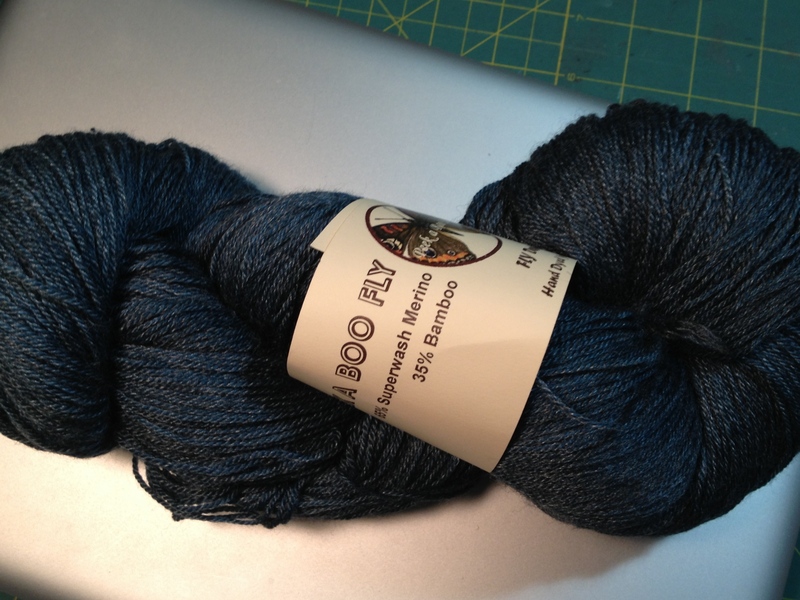 This is destined to become an Alexandra Shawl. 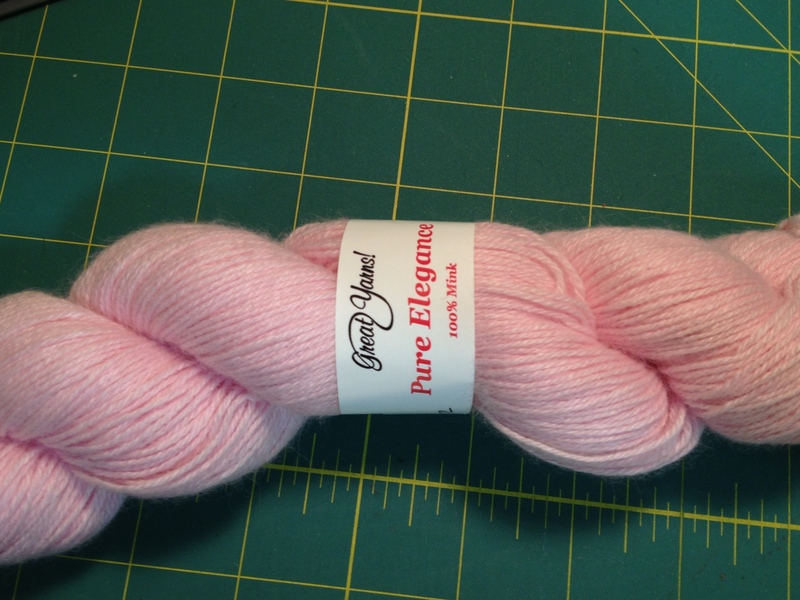 I'll probably have enough for another project too, because the yardage is incredible – 1120 yards! And as soon as I saw this I had to have it! Pink mink! Who knew? Sally and Lorette and I are going to host a KAL over on the Knit Companion Ravelry site. We thought a Pretty Thing cowl and matching mitts would be just the thing. Did I mention they both bought mink yarn too? Although not pink mink. My other purchase was some Chiaogoo needles. I've been eyeing them online and once I saw them in person, I was definitely onboard. Here they are on my current pair of socks, Hedera, in Knit Picks Stroll. The finish is just slightly brushed so the stitches slide along easily, but do not slip. The cables are firm and have no memory and no kinks. And the joins! Oh, the joins. They are the smoothest I have ever encountered. And the price??? Only $8.00 for a 24 inch. Bargain! 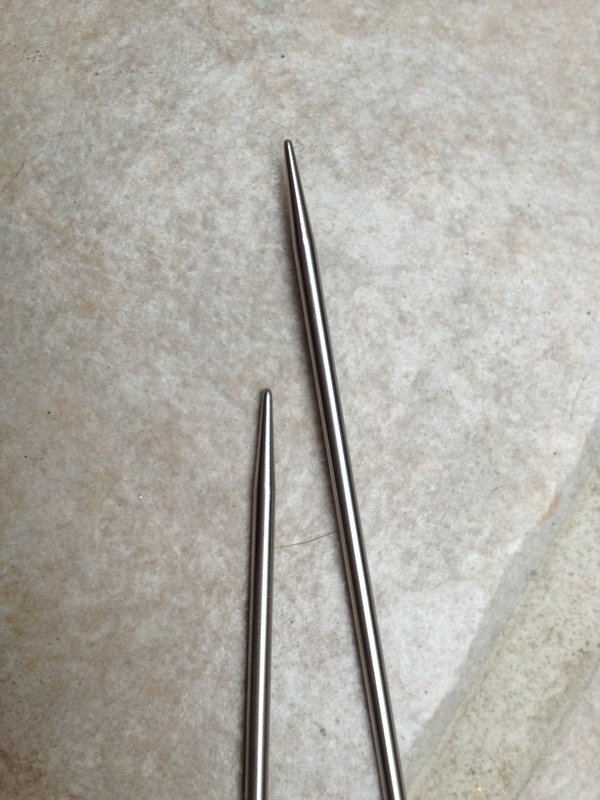 Recently I caved and bought a couple of Signature needles. Now, they are really, really nice and a pleasure to knit with. And until I ran across the Chiaogoos I was going to give them a glowing report. But I honestly can say that they aren't any nicer than the Chiaogoos and much more expensive. As luck would have it, I happened to mention this at the Knit Companion class I taught yesterday and one of the ladies offered to buy my Signatures. Deal done, and with the money for that plus my fee for the class, I had enough to buy a set of the Chiaogoo interchangeables. Can't wait until they get here. I'll give you a full report. 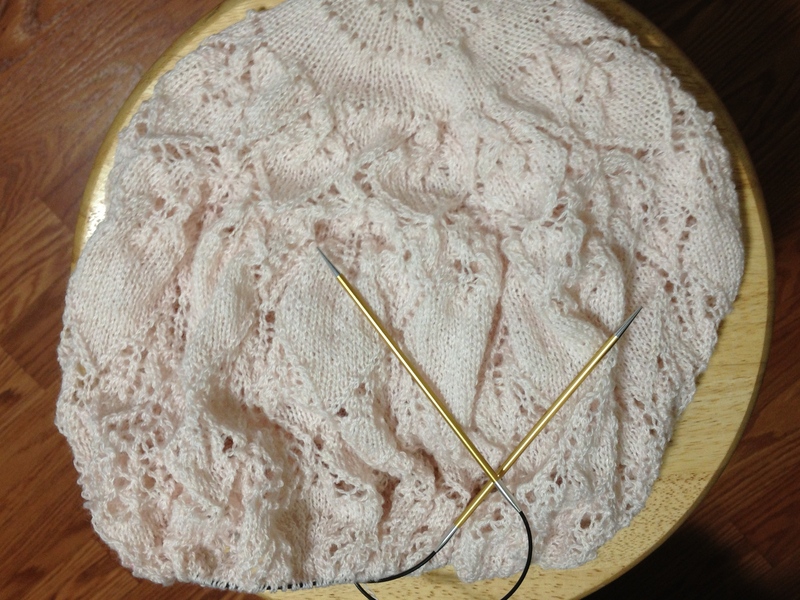 On the needles now – Evenstar. I'm still not sure how the fit is going to work out on this. 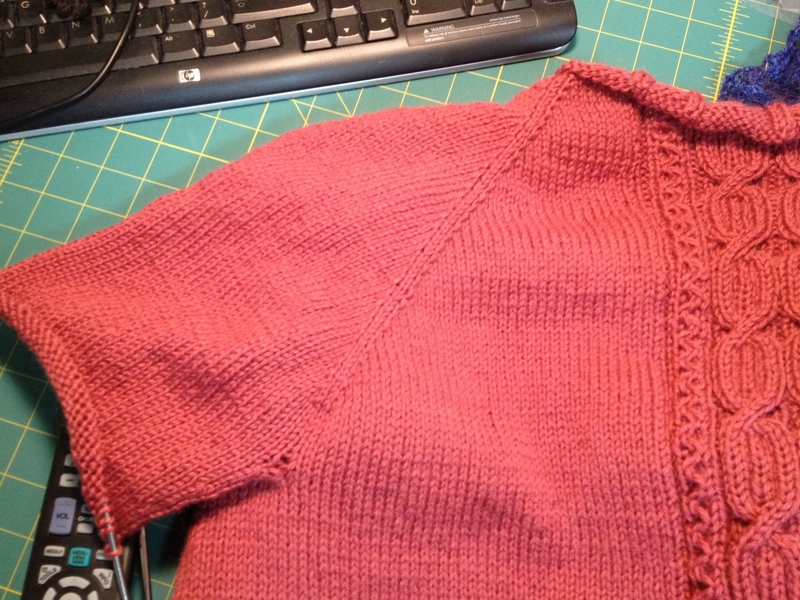 This is my first top down adult sweater and I'm hoping the armhole is deep enough. That's it for now. Tonight I have to get at least one row done on Evenstar to free up the Signatures so I can mail them to their new owner tomorrow. But I'm really itching to get back to my socks on the Chiaogoos! Life has been pretty exciting lately, so grab a cup of coffee and sit a spell while I catch up. 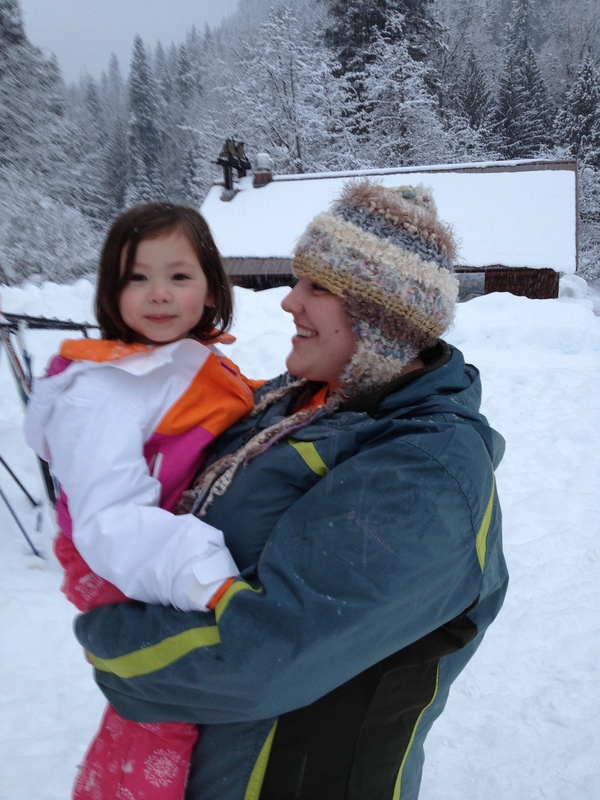 Two weekends ago we took the granddaughters to our church's snow camp. This is held up in the Cascade Mountains in a beautiful valley set in among the mountains. 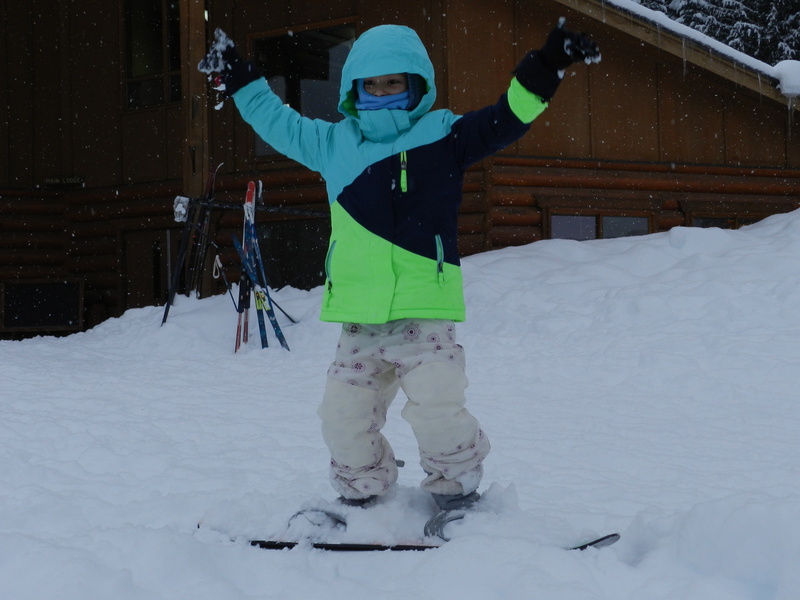 We were blessed with lots and lots of snow, which is the whole point of a snow camp. Fortunately, the roads were pretty decent. It's always a balancing act to have lots of snow with clear roads. It was a lot of work for the grandparents (we're not as young as we used to be! ), but both girls seemed to really enjoy themselves. 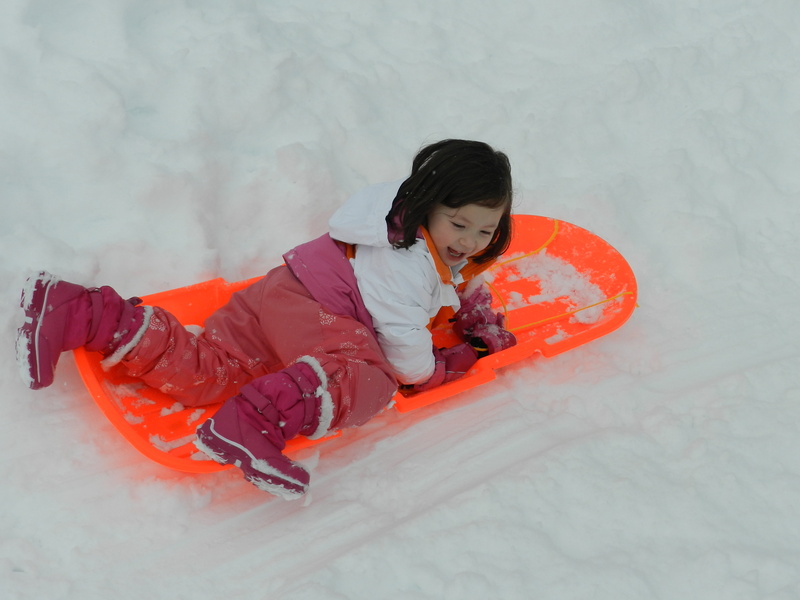 Mei-Mei was a bit of a pill as she was determined NOT to wear her snow suit. Once she realized she was not going out in the snow without it, she would relent, but she made us work at it! Most of the time, however, she was utterly charming and everyone fell in love with her. The big highlight of the weekend was that she lost a tooth. 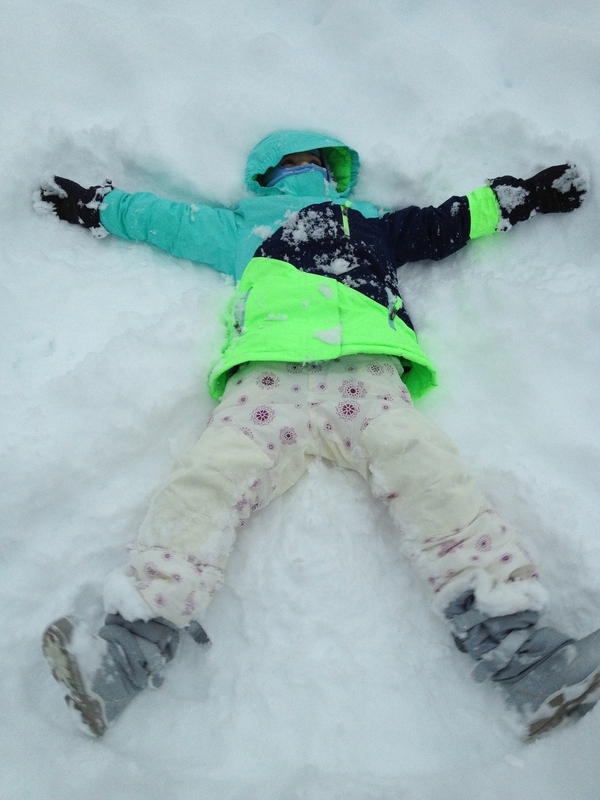 She was delighted to find out that the Tooth Fairy could find her way through all that snow! Isobel proved herself an outstanding athlete! 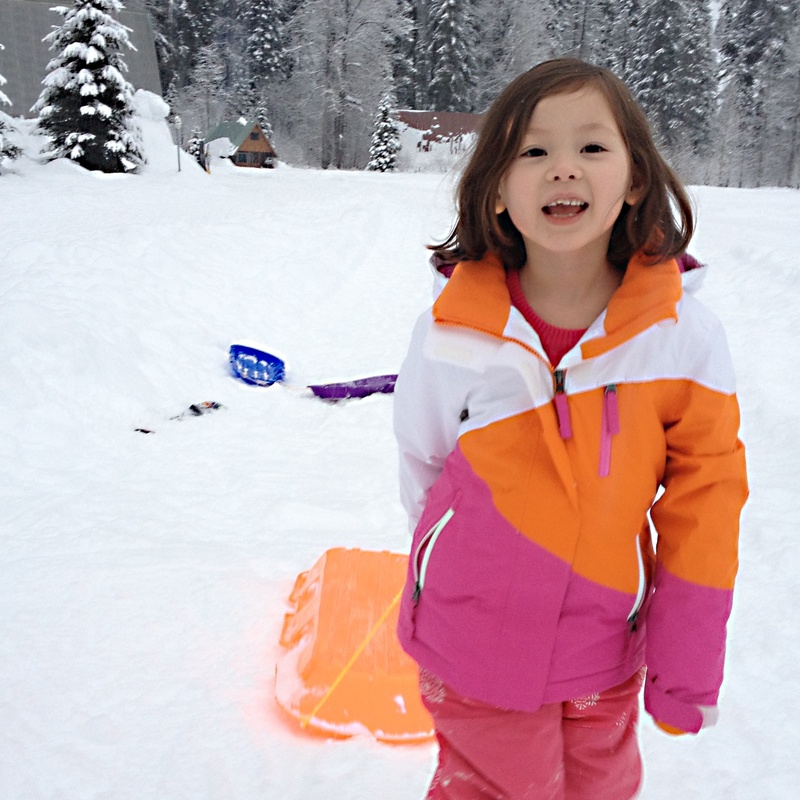 She took to cross country skiing and snowboarding like a champ. Someone asked her how many times she fell down. She replied, "About a million times." How many times did you get up? "A little over a million times." 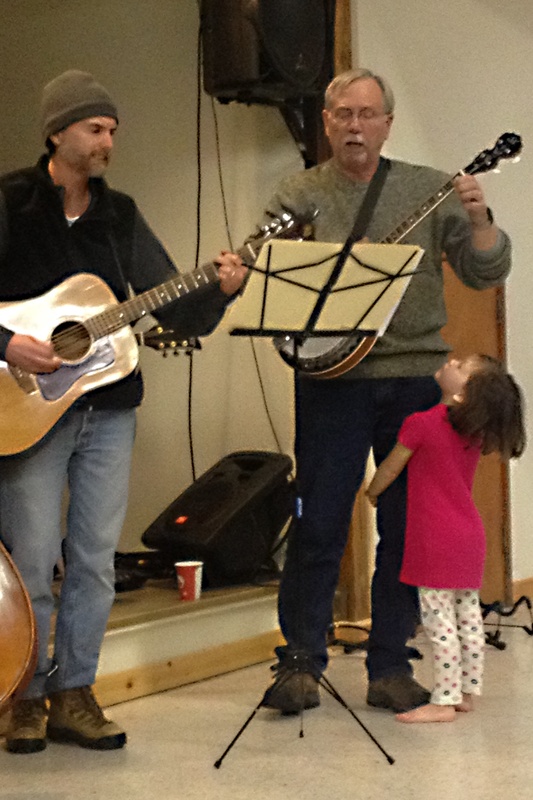 During the church services hubby played the banjo with his bluegrass group, but found it a little hard to concentrate with someone hanging on his leg. All in all, a great trip and one we will repeat next year. Mei-Mei has promised to wear her snow suit without fuss. This morning I came to a little epiphany about both my knitting and running life. They both concern doing things for others' expectations and not my own. First off – knitting. I think I was a little rash jumping on board the Dragon KAL. I am hating knitting this! Usually I love lace, even the difficult lace. This one is just plain no fun. I've dragged along, hating to let everyone down on the KAL, but considering this would probably take at least 6 months to a year to complete, that's a long time to spend on something you hate. So it is being frogged. Right now I'm concentrating working on Evenstar and am looking for another lace project to utilize the yarn from the Dragon. On the running front, I had joined a running club and was so happy to know that I was not in training for the half marathon alone and was looking forward to running with others. It has not worked out that way. I am the slowest runner in the club and despite their promises that "no runner will be left behind", on our runs they drop me like a bad habit. One of the other slower runners and I decided to beat them at their own game and start out early to get a head start. This morning it occurred to me that this is insane! Why am I trying to keep up with people who clearly don't care enough about me to include me? In trying to keep up I am running harder and faster than is good for me and am risking injury. And I am becoming discouraged. So as of today, I will resume training on my own. One of the things that running is teaching me is that I am only in competition with myself. I will always be one of the slowest runners, but that doesn't matter if I'm doing it because I love it. This raises the whole philosophical question about why we do many of the things we do. I know that there are things in our lives that are less than pleasant but that are really necessary and we must have the discipline to do them. But how many things are we doing because of pressure or expectations from other people? I hope this year I will have to courage to either not start them in the first place or to stop when I realize that I am doing them for the wrong reasons! Next week I hope to have more knitting news for those of you whom come here for that. On Thursday I'm driving down to Lorette's and we're going to Madrona together. We'll not be taking any classes, but are excited about meeting up with the developer of Knit Companion! Should be lots of knitterly eye candy for you next week.